We’re surrounded by fellow good farmers who labour hard just so there would be safer foods for us. Other than being small scale producers, they too take up the role as guardians, safeguarding few pure lands left in the country. 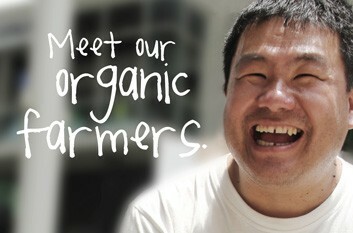 We admire the unwavering spirit and determination of these farmers. For more than a decade, they give us a peace of mind, knowing what we bring home feed the health and wellbeing of our loved ones. 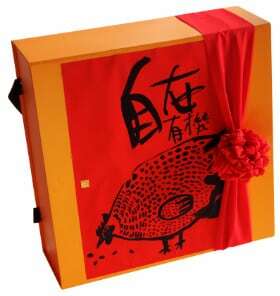 For this very reason, our Lunar New Year Hamper is filled with artisanal goodness from sincere local people—every single handcrafted product is packed with care and good thoughts from the makers. Seven heartfelt goodness come with seven stories of the farmers and producers. 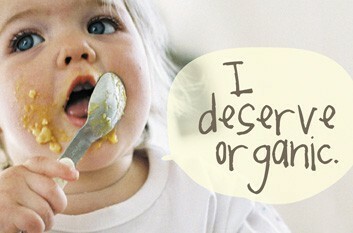 What would be better than getting to know them personally through tastes and understanding on foods they prepare? We always hear farmers jokingly say, “Sky is our boss.” It’s a widely known fact that climate and weather conditions a ect agricultural activities; it’s especially challenging for organic farmers. 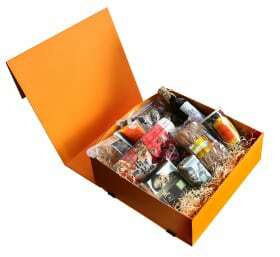 By choosing this hamper, you’re supporting local farmers and small scale producers—the best form of appreciation and encouragement shown to the community in this festive season. 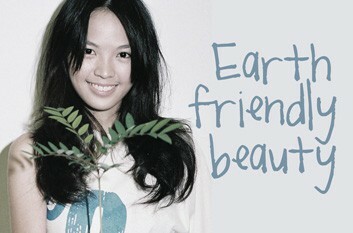 Spread a little positive vibes for the sustenance of green living. 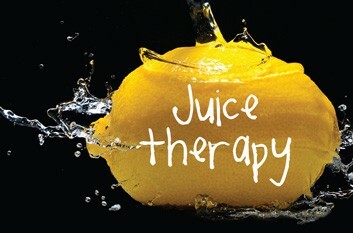 Here at justlifeTM, we wish you good health, prosperity and many happiness to come. Gong Xi Fa Chai! Bario Highland in Sarawak is fondly known as the Valley of the Wind, surrounded by mountain range and luscious wood- land, perhaps, it is the State’s last piece of uncontaminated pure land. Local natives plant once a year. The harvested Bario rice is lim- ited in quantity and of supreme quality. It is prized as one of the world’s best crops, is traded at high price in Slow Food Italy, and yet it remains little-known among us. Unfortunately, industrial farming began to penetrate this land in the recent years. Majority of the Bario rice found in the market is no longer planted using traditional farming method which is free from agricultural chemicals. 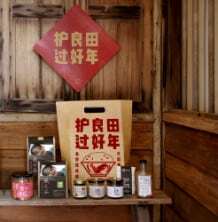 EarthistTM supports dedicated farmers who still insist on practising Earth-friendly farming to preserve the precious rich soils; and to retain the authentic favour of Bario rice. Take your time to savour every bite of this precious rice. For each and every grain is brought to life with hard labour and filled with robust vitality of Mother Nature. Fresh herbs bring fond memories to Ivan Ho, the founder of Kampung Harvest. Childhood memories of how they were planted; of the touch and scents of dried herbs—how they were preserved, weighed and blended by his grandfather to remedy common discomforts among family, friends and local community. 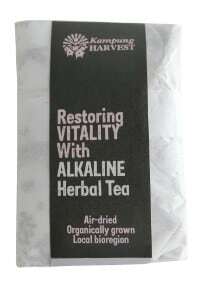 Like his grandfather’s tea blends, Kampung Harvest Organic Alkaline Herbal Tea uses herbs that are available in our local bio-region, planted in living soil and prepared with thoughtful tenderness of the hands and hearts. A simple infusion that is refreshing and relaxing; one that gently realigns the acid and alkaline imbalances in each of us. Green Acres 豆蔻果酱选用农地新鲜采摘的有 机豆蔻，加入有机蔗糖调味，就这么简单， 却让你得以品尝最天然真实的豆蔻滋味! The distinctive fragrance of this fruit is why nutmeg is also known as Myristica Fragrans. Nutmeg trees grow in tropical region and are especially suited for cultivation on the hilly terrain of Balik Pulau, Penang. Green Acres, a 16-acre orchard located in Balik Pulau, has kept its land chemical free for the last 60 years. Its nutmeg trees bear big palm-sized fruits which are made into teas, syrups and preserves; while the seeds are sun-dried and made into spices. 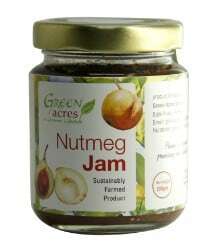 Its nutmeg preserves are made with freshly-picked fruits from the farm and organic cane sugar. With only these two ingredients and nothing else, Green Acres’ nutmeg preserve gives you the natural taste of actual nutmeg. 然而，《呆食》的创办人礼雄，在一次偶然的 机缘下发现发酵的黄豆，被捣烂与磨碎时， 味道正恰如马来栈。真这是让人乐不可支的 发现啊!《呆食》有机素食马来栈用于日常 料理中，开胃又下饭，保证让你吃完一碗再 一碗! The readily available belacan commonly found in the market is made of shrimps, hence, it is also known as the shrimp paste. Vegetarian belacan is a rare nd, especially an organic one. It is rare because what could possibly replace the avourful and aromatic blend derived from such non-vegetarian origin? 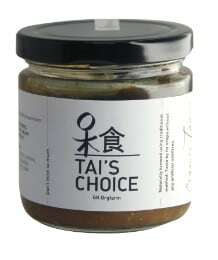 Surprisingly, Lee Shyong, the founder of Tai’s Choice discovered that fermented soy beans, when pounded and ground, they taste like belacan—the joy and bliss from this accidental discovery are beyond words! 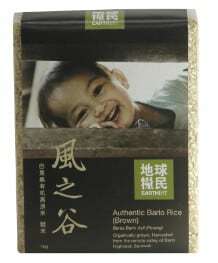 Sprinkle Tai’s Choice Organic Vegetarian Belacan on your dish, and soon you will be filling yet another bowlful of rice. Taucu, also known as fermented soy bean paste, is one of the favourite ingredients used in Asian cuisine. and reach maturity in 45-60 days. 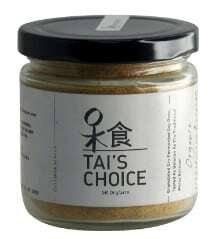 Tai’s Choice Organic Taucu comes from the nurturing of warm sunshine, classical music and the passion of its maker. 这无疑是一个更健康的烘焙选择。然而如何 在有限的食材里，烘焙出依然可口的糕饼， 这确实不易，Eve却做到了，这就是她让人 赞叹之处!本地有机农夫栽种的百香果与洛 神花，经她巧思发想，竟成了独创的百香洛 神花脆饼，尝一口酸酸甜甜，欢喜过好年! Eve, founder of Origene Bakery, is a daredevil who constantly taking up baking challenges. Started from her career as a pre- school teacher, her strong interest in baking prompted her to pursue as a full-time baker. Her journey began in a home bakery attempting small scale bakes using natural ingredients 10 years ago. On a fateful chance, she encountered a different way of baking—fully organic, dairy free and eggless—which is always deemed as impossible for many. A healthier option, yes, and the challenge lies on baking them deliciously good using restricted ingredients; that is the strength of wonder Eve. 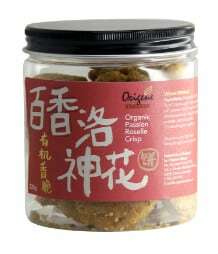 Origene Bakery Organic Passion Roselle Crisp, burst with delightful sweet and sour flavoured from locally harvested passion fruits and roselle, makes good nibble anywhere, anytime, especially on this festive season. Wonder Wilderfarm is located at Pusat Agropelancongan in Relau, Penang. It is dedicated to promoting community involvement in the farm through various activities; and it is committed to be transparent in food production. The farm offers fresh vegetables daily to the locals. And when there is excess supply of seasonal harvest, it also produces ready-made artisanal products in small scale, giving its crops a second chance to live. 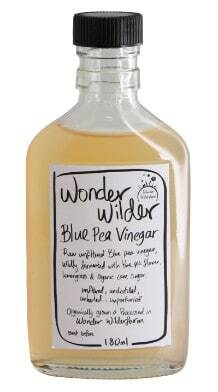 Wonder Wilderfarm Organic Vinegar is made from raw ingredients handpicked fresh from the farm. After thorough cleansing, they are fermented using organic cane sugar. It comes in 3 varieties: ambra, blue pea flower and roselle. Each and every bottle of vinegar is alive with friendly bacteria that gets clearer and smoother as it ages. According to the local farmers, Bario rice was first planted by the native tribe called Kelabit in Bario Highland since 4,000 years ago. Before the influx of agricultural chemicals, Bario Highland in Sarawak is prided as one of the State’s last piece of uncontaminated land where natural farming is widely engaged. Unfortunately, the rising use of agricultural chemicals in recent years has threatened the heirloom grain. The number of farmers who are practising traditional organic farming has drastically reduced. Hence, most of the Bario rice found in the market nowadays is no longer of the precious crop originated from chemical free pure land. could be preserved for generations.